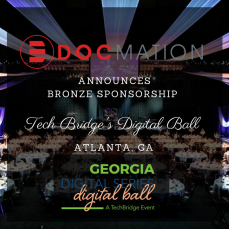 ATLANTA, Georgia - March 14, 2018 - PRLog -- Docmation today announced Bronze Sponsorship at TechBridge's Annual Ball 2018 - scheduled to be held in Atlanta Marriott Marquis Atrium Ballroom, Atlanta, GA on April 21, 2018. The Annual Ball is a matching grant opportunity which encourages nonprofits to dream big about implementing a technology solution. Currently, the Dream Big Grant is offered in the states of Alabama, Georgia, and Tennessee. The Dream Big Grant significantly increases the power of nonprofits to transform their operation in a way that increases their impact and ability to accomplish their mission. Commenting on this sponsorship, Prasad Pamidi, Founder and Principal of Docmation said, "Docmation has always been active with its pro bono initiatives. Also having won the 'Business of the Year Award for Service' by Manna Fund earlier this year, we are excitingly looking forward to our presence at TechBridge's Annual Ball. I am sure TechBridge ball will extend our endeavors for boosting nonprofits with their Dream Big Grant, an initiative towards increasing the capacity of nonprofits with seamless technology to positively impact the lives of vulnerable individuals, families, and children." Docmation has been providing high-end technical support and services for non-profits like Manna Fund, Hire Heroes, Twin Cities Tutoring, African Community Center, Science from Scientists, Culinary Care, Children's Future, Haiti Now, Buckminster Fuller Institute, Sunday Suppers, and UpWorld Inc among others. Docmation is a Salesforce Silver Consulting Partner, particularly focusing on implementing robust Salesforce Communities. With over 10 years' of experience and expertise in working across all Salesforce Clouds, and with a thriving team of more than 60 certified Salesforce experts, Docmation helps organizations build high-performing online communities that support critically important business goals across functions like customer support, sales, marketing, and employee engagement. The client base of the company comprises of global names like Novartis, Coca-Cola, Hackett group, Ithaka, Children's fund, Sanofi, GFI, Family Foundation, Sage and more. You can find more information about Docmation at http://www.docmation.com. This year's Digital Ball will include some exciting additions.Guests will be greeted by several new interactive activity stations positioned through the welcome reception. Usually, TechBridge's Digital Ball includes crowdfunding to fund one nonprofit's implementation project and the annual Technology Innovation Award, presented by Accenture. But this year, their crowdfunding campaign during the Ball will focus on a new TechBridge grant fund from which more nonprofits can be awarded the types of transformative projects awarded in prior years to the annual TIA winners and crowdfunding recipients.